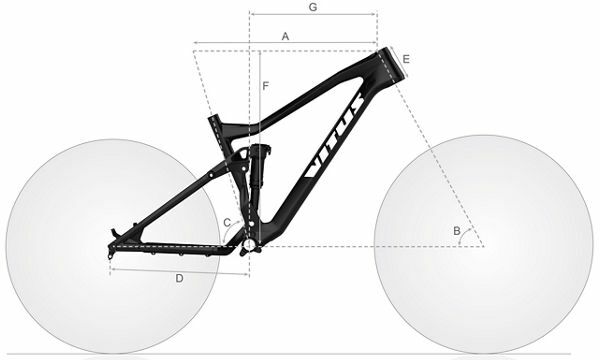 The Sommet CRX is Vitus's Carbon Enduro bike, using a monocoque carbon front end coupled up with an alloy rear triangle. The Sommet is designed to battle through any descent that stands in its way, whilst being able to climb effortlessly and smoothly. Enduro racing; hammering technical descents; ascending with finesse; finding your limits long before you reach the limits of the 155mm travel Vitus Sommet! When performance and reliability are top of your list; get onboard the new Vitus Sommet and claim your place on the top of the podium! The Sommet CRX features a full carbon monocoque ABS constructed front triangle; 3K weave with UD finish; BB92 bottom bracket which enables increased stiffness through maximised down tube profile & fully internal cable routing! Your trail could be a silky smooth ribbon of singletrack, or a rock-infested goat trail in the Alps. Either way, the 160mm Pike fork will get you through. The Crossmax XL Pro LTD 650B wheels come fitted with a pair of WTB Vigilante/Trail Boss tyres & combined offer superb grip, traction, strength & superior performance. The Enduro wheelset used by the pro's. Finishing the Sommet off is a collection of own brand parts from Nukeproof. Using a Nukeproof Carbon riser bar, a Nukeproof 3D forged 35mm alloy stem, 31.6mm RockShox Reverb Stealth dropper seatpost and a Nukeproof MTB specific saddle with Ti rails. A great, light-weight finishing kit to top the Sommet off. If you after a snappy handling mtb and enjoy off-road endurance riding then a Full Suspension Mtb is for you. At Wiggle we stock the very best spec'd full suspension bike brands in Felt, Focus, Kona, Mongoose, Rocky Mountain, plus loads more besides. All our full suspension mountain bikes provide a superb riding experience with quality rear shocks and suspension forks, from XC, Freeride, Enduro through to Downhill, Wiggle will have the bike for you. You will find that the wide tyres give you bags of grip and together with the front and rear suspension you will easily glide over trail detritus, roots and rocks. So you'll be likely to be pushing your own limits before you find the bike's!